In these two chapters, we study the beginnings of Jesus' first Sermons. Scholars disagree on whether the Sermon on the Mount (Matthew) and the Sermon on the Plain (Luke) were originally the same sermon or not. While there are similarities, there are major differences. Matthew's Sermon is a spiritual discourse. It views Christ as the King of the Jews, and as King, he describes what the residents of his kingdom are like. Meanwhile, Luke focuses on issues that relate to the Gentiles, who would not understand the Mosaic Law (eye for an eye, adultery/lusting, etc), but would understand social justice (caring for those who are poor). For Luke, it isn't a description of who merits the kingdom, but divides the righteous from the wicked. The poor (not poor in spirit, but those living in poverty) will receive the kingdom. The poor, regardless of their actions, works, etc., have a ticket into God's kingdom. With Christ, the hungry will literally be fed, which we find later when he feeds the multitudes. Those who mourn/weep, shall laugh and have joy. Insightful are the woes or curses that Luke adds. They are the exact opposite of the blessings given. The rich, those who are not hungry, those who laugh now, and those who are accepted by the people, shall all be rejected. Because of his focus on division between those well off and those who suffer, many Bible students only focus on Matthew's sermon today. I do believe there is greater value in Matthew's sermon, which focuses on the spiritual inner workings of mankind, rather than on a physical need of humans to have the comforts of life. In this instance, Jesus seems to be attacking the wealthy and comfortable, while preserving his kingdom only for those who suffer. And yet, the gospel promises us help and joy (laughter) not only in the next life, but also in this one. As it is, the word "poor" that is used here can also mean "pious." In fact, the two terms were often seen together, just as "rich" and "wicked" tend to be synonymous. For Matthew, the Beatitudes are a Prologue to the rest of his sermon. They set the stage for his comparing the Law of Moses with his own set of higher Laws. The Law of Moses established what was necessary to dwell in the Land of Israel. Jesus' Law established what was necessary for living in the Land of Christ's Kingdom. The Mosaic Law is calculated to have over 600 rules, not including the additional rules added by the Pharisees in order to build a wall of protection around the Books of Moses (Torah). Jesus' rules fit in 3 chapters of Matthew. 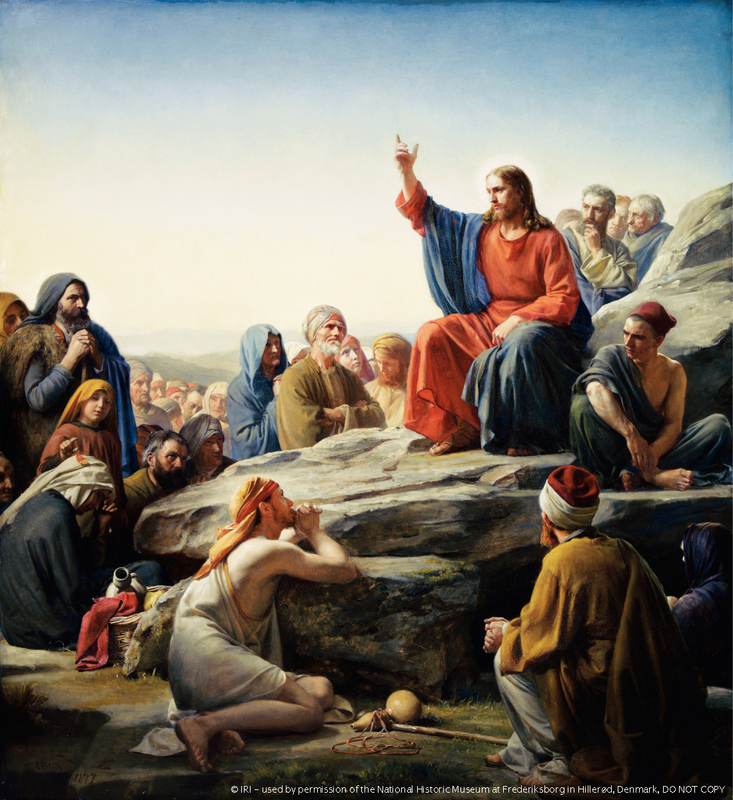 Unlike the Pharisaic rules that focused on outward practices, the Beatitudes establish an inner spiritual self. They are challenging, as they progress from being "poor in spirit" to meekness, to hungering after righteousness, and finally to being pure in heart, peacemakers, and persecuted with the prophets. In this progression, we learn to become "perfect even as your Father which is in Heaven is perfect" (Matthew 5:48). Scholars disagree as to how one reaches perfection. Martin Luther considered both the Law of Moses and Jesus' teachings in this sermon as impossible to achieve, and used it to insist that we are saved purely by grace, without works. Others see it as possible to earn one's own salvation by living everything noted in the Sermon. Yet there is a better and more correct way. We learn from taking the entire restored gospel as a whole that the Sermon on the Mount is achievable, but only through the sanctification of Christ's blood and the justification of the Holy Ghost. Christ makes us sinless, so then as we receive the Holy Ghost, we can learn to become ever more perfect in meekness, purity, and righteousness. So, as Christ received grace for grace, going from grace to higher grace (John 1, D&C 93), we can obtain a fullness as well. For many of this, this may not come in this life, but through Christ, it can and will come to us as we strive in the Spirit to follow our Savior's path. Looking at our own lives, the lives of those around us, and the life of Christ (which we learn in the scriptures), we may be able to score ourselves from 1-10 on how we are developing our meekness, hunger for righteousness, avoiding lust, loving our spouse, and saying quality prayers that reach heaven's gates. In doing so, we must be cautious not to be making Pharisaic checklists of our outwardly actions, but score on what is going on inside our hearts, minds and spirits. But the meek shall inherit the earth; and shall delight themselves in the abundance of peace. (Psalms 37:11). Here, the Psalmist reflects two of the key components of Jesus' blessings (meek and peace). Psalms are closely tied to the workings of the temple. For Jesus, the temple was his Father's House, and represented the Kingdom of God on the earth. In a coming day, when Jesus would come for his Second Coming, the earth would literally become a holy place, which the meek would inherit and the Savior would rule. Until then, the connection to the temple, Psalms and the Sermon on the Mount are unmistakable. This holds true for modern Latter-day Saint temples, as well. The teachings from Psalms and the Sermon become alive in the temple, as disciples embrace the atonement of Christ, learn to listen to and follow the Holy Ghost, and partake of covenants and ordinances that lead us to become perfect in Christ. Better is one day in your courts than a thousand elsewhere; I would rather be a doorkeeper in the house of my God than dwell in the tents of the wicked. (Psalms 84:4-10).